Immediately after President Trump’s inauguration, the former White House Chief of Staff, Reince Priebus, issued a government wide regulatory freeze, putting the brakes on Department of Energy efficiency standards on a range of products that were already pending approval products including portable air conditioners and commercial boilers that were already pending approval. On top of that, President Trump’s budget for fiscal year 2018 picked out the Environmental Protection Agency’s ‘Energy Star’ programme, a voluntary energy efficiency certification scheme, as one of the programmes to be ‘eliminated’. Rumours abound that President Trump is also considering rolling back fuel efficiency standards on vehicles for 2022 to 2025. But is cutting back environment and energy regulation justified by sound economic or environmental rationales? Do we have enough evidence to suggest that these standards are costly to consumers? Why do we have energy efficiency standards? Standards were introduced to encourage consumers to buy more energy efficient products and to encourage firms to produce more of these goods. There are two common economic reasons for imposing standards on energy-using goods. The first is that using energy has unaccounted negative impacts on other people, for example by causing air pollution which damages health and costs money to manage (costs which might be recouped through taxation). This isn’t factored into most energy prices so energy is cheap to use and there’s no incentive to cut back. Energy efficiency standards could reduce energy usage and so decrease some of the negative impacts. The second is that when there are no efficiency standards private consumers tend not to choose the most energy efficient durable goods like cars and washing machines even if they are cheaper to use in the long run. Take for example the use of light bulbs. Switching from incandescent light bulbs to LED could result in savings of up to £622 ($934) largely through greater energy efficiency. Nonetheless, incandescent and halogen bulbs still represent roughly 50% of recent shipments to the US. For 100,000 hours of light LEDs could cost US$934* less than Halogen bulbs. 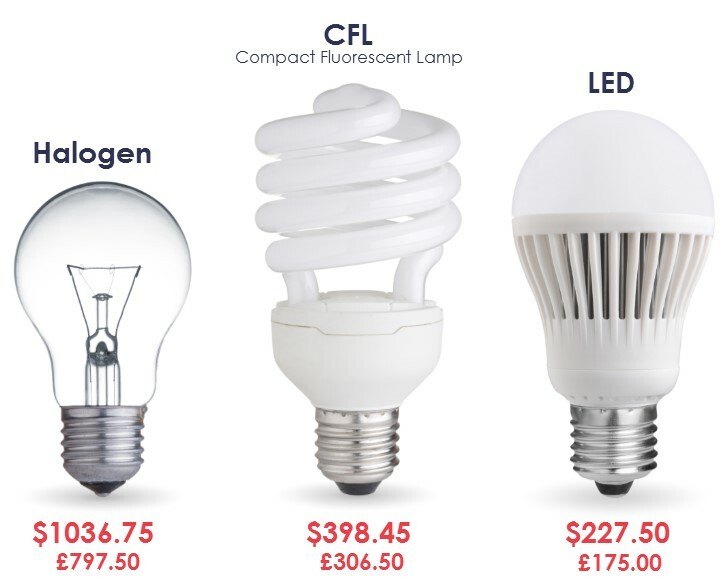 *Assuming that the lifetime of the LED bulb is 10 years using 100 kWh per year, and that savings in the future are worth 5.6% less per year than they are now, the switch would still generate $652 (£435). Why do consumers buy bulbs which work out as more costly? It could be that risk-averse consumers don’t know enough about the performance of the product or might be unwilling to make an investment if they will not benefit directly (for example a landlord might not buy an expensive bulb if they will not recoup savings from the electricity bill). Or it could be that the upfront cost is more noticeable and consumers are short-sighted about future costs like energy bills. Efficiency standards can help fix these ‘market failures’ by making sure the products sold are the ones that will save consumers the most. However, not everyone is convinced that energy efficiency standards save consumers money. Public perception is that standards burden customers by limiting their choices and forcing them to buy expensive energy efficient products. A new research paper in the Grantham Research Institute Working Paper series finds that contrary to common belief, energy efficiency standards could benefit consumers and their pockets. Using data from sales of washing machines, refrigerators, air conditioners and clothes dryers in the US between 2001 and 2011 we found that the average price of appliances regulated by energy efficiency standards (when the quality is held constant) declined over the period studied. For washing machines, the most regulated appliances in the study, average price fell by $464 over the study period. Average price (holding quality constant) also declines faster around the time of energy policy changes (about 1.5%) compared to unregulated products. 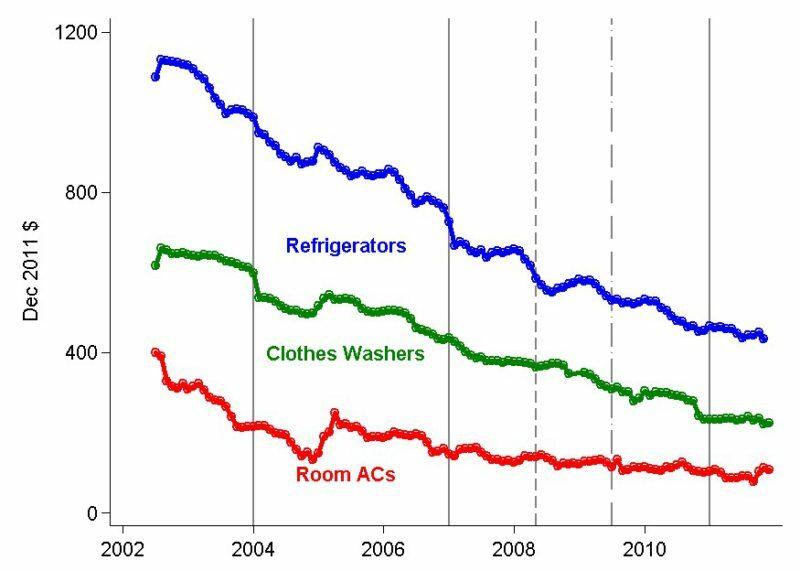 The average price of washing machines, refrigerators and air conditioners of the same quality dropped between 2002 and 2011. The solid vertical lines represent the effective date of simultaneous policy changes in the federal minimum energy efficiency standard and Energy Star certification threshold, while the dashed line is for the Energy Star threshold change that took effect in July 2009, all for washing machines. Refrigerators had changes in Energy Star certification thresholds in January 2004 and in May 2008 (represented by the dashed dotted vertical line). All prices are in December 2011 US dollars. In addition, the data showed that quality increased over time, with appliances not just becoming more energy efficient, but also improvements in other attributes (e.g. number of wash cycle options). The rate of increase is also faster around the period where energy standards are changed. Together, these observations indicate that manufacturers are introducing appliances that are more energy efficient appliances and of higher quality. At the same time, average prices of regulated products are becoming cheaper, with prices dropping at a faster rate around energy policy changes. So energy efficiency standards unambiguously benefit consumers. They get better quality and also lower prices. But what’s driving this trend? Energy standards might make manufacturers compete more. Standards can make regulated appliances become more `similar’ by making them all energy efficient. Consequently, standards can make targeting different customer niches difficult for manufacturers, forcing them to resort to more price competition. If this is the channel by which standards can influence price, then introduction of new models by other manufacturers should drive the price decline. In our study we did not find strong evidence supporting this channel. However, we found that price declines were driven by the introduction of new models by the same manufacturers rather than by competitors. Instead of competition we found evidence that energy standards are accelerating innovation and deployment of technologies. As more stringent energy efficiency standards are brought in they force firms to bring new products to market, which might otherwise have been delayed or spread over time. It might be more profitable for firms to bundle other innovations into the new models to make them novel compared to competitors – quieter washing machines for example. Consequently, older products face greater competition with newer ones, so firms cut the price of older models so they can continue to make sales on them. We didn’t look at what the impact is on manufacturers. Energy efficient products might be associated with increased production costs which could be detrimental for firms but greater innovation might also drive down production costs from lessons-learnt. Given these observations, it’s very difficult to assert that energy efficiency standards are ‘burdensome’ to consumers. It is also important to emphasize that the benefits for consumers are in addition to the potential health and wellbeing benefits from the reduction in carbon emissions, both at the local and global scale, associated with energy use. So is President Trump’s cutting back of environment and energy regulation justified by sound economic or environmental rationales? Probably not! This commentary is based on research published in the Grantham Research Institute working paper series. The paper, authored by Arlan Brucal (Research Officer at the Grantham Research Institute LSE) and co-author Michael Roberts. The Working Paper has been submitted to a journal for publication.